With a pair of losses to the University of Saskatchewan Huskies, the U of M Bisons men’s hockey team has now lost 11 in a row. With a pile of losses already obscuring a playoff berth from view, many fans have been left scratching their heads. How has a team that placed fourth last season fallen so far? In the midst of a 2-11-1 opening half of the regular season schedule, a looming issue hangs over the men’s hockey team. The club’s powerplay is killing any chance at claiming a playoff berth. While not the backbone of a team’s offence, the powerplay can be a make-or-break factor in tight conferences and leagues. With no more than four points separating the bottom two teams in Canada West from the final playoff spot, this is the exact situation the Bisons find themselves. A successful powerplay — like that of University of Alberta Golden Bears, which is operating at 25 per cent — can almost guarantee a goal or two a game. Teams in Canada West currently average four penalties a game, which for the Golden Bears gives them a potential goal per game on the man advantage. Essentially, Alberta steps onto the ice already up 1-0 with that goal banked. Following the weekend series with the University of Saskatchewan Huskies, the Manitoba powerplay is shooting at 15.7 per cent. This is fourth in the conference and amounts to less than a goal per game according to conference penalty averages. The situation was much worse for the herd before the weekend with Saskatchewan. In its weekend series with the Huskies, Manitoba notched four powerplay markers on eleven attempts. The herd was swept 6-3 and 8-2 in the two games. Taking away the four goals scored on the powerplay against Saskatchewan, Manitoba was shooting at 10 per cent heading into the weekend. With the herd drawing just over three penalties a game, the man-advantage will only produce a goal, on average, every three games. However, if a team is lacking an overly strong powerplay they can still win games by playing well at 5-on-5. Such is the case with the Bisons women’s hockey team, which has yet to score a powerplay goal on the road this season but sits first in the conference. This is not the case with the men’s team, though. The Bisons have 25 even-strength goals through the first 14 games, averaging 1.79 goals per game. With 33 total goals-for on the season, Manitoba sits sixth in the conference. 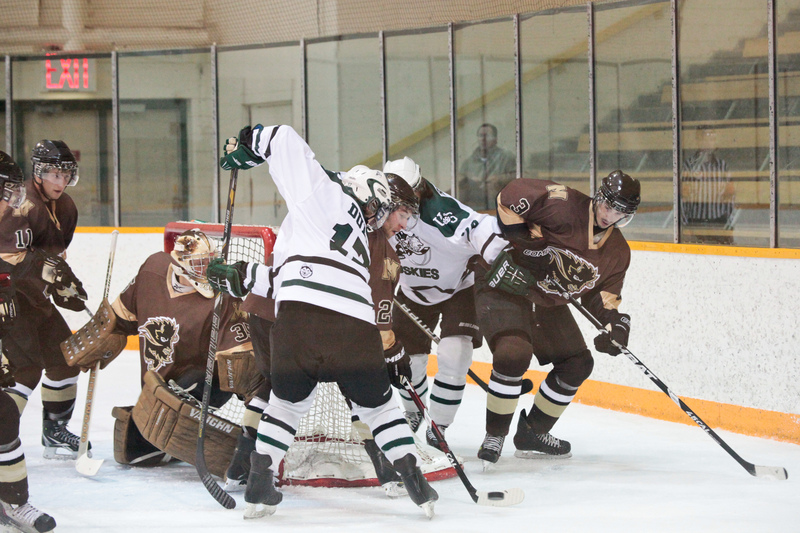 Of teams in playoff position, the herd is actually outscoring the University of Lethbridge Pronghorns by a goal. However, Lethbridge has allowed 52 goals on the year, while Manitoba has allowed a conference-worst 65. As it stands, the Bisons men’s hockey team in is no man’s land. The club is neither an offensive powerhouse that can blow an opponent away by firing at will, nor a defensive stalwart that wears teams down to eke out a victory. The aggressive, grinding identity the herd plays with will only pay off if they can draw penalties, capitalize on those opportunities and make it difficult for the opponent to get into the offensive zone. With the powerplay percentage, number of penalties drawn and conference-worst goals-against, none of that is happening. All is not lost, however, as the crop of rookies currently taking reps for Manitoba provide a silver lining. Keaton Jameson has looked good as the club’s first-line centre, while Jeremey Leipsic has three goals in his past five games. Leipsic also has a ridiculous 44.4 per cent shooting percentage through 12 games. Toss in solid defensive looks from Mackenzie Dwyer and a potential goaltending stud in Tyler Brown on the horizon, and things are beginning to look better for Manitoba as this difficult season wears on.